Colton has always been my number one but seriously the man is like a fine wine that just gets better with age. Bromberg shines again through her original characters Rylee & Colton yet again. As the culmination of their stoty Bromberg doesn’t disappoint. Giving us a glimpse into their lives between the ending of Crashed & the epilogue. & boy oh boy does it pack a punch! I bawled more reading this book than any of the others. But while I cried lots of tears in sadness, my hesrt was also full of love, hope & admiration. The men, Colton, Andy, Becks & Shane (yes Shane!) all shine as they step up to the plate to support each other & Rylee. Colton shows immense growth in his character. Shane has grown into a fine young man who will protect Rylee at all cost even if it means standing up to Colton. His love & support he shows the younger boys, especially Zander is breathtaking. Whether you are a long time fan or you have recently found Colton & Rylee, you will fall in lovr with them all over again! So what are you waiting for! One click this bad boy & batter up or start your engines & get reading!! Thank you Kristy... Thank you so much for giving us more Colton and Rylee even when you weren't overly keen on the idea, Thank you for creating such an honest, truthful, brutal, raw, heartbreaking yet beautiful story for them/us. 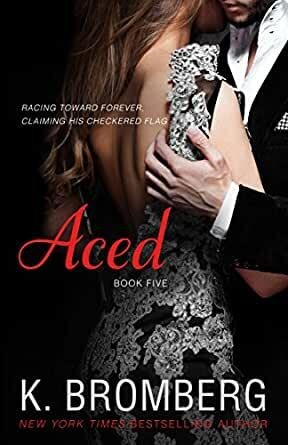 I laughed, I cried, I loved and understood... if you hadn't already made these characters so amazing and relatable you definitely did with this final story for them... Aced tied everything up into a perfectly unperfect bow that is Colton and Rylee. As sad as I am their story has finished this was absolutely my favourite book in your entire series... I felt like I started it a lifetime ago and yesterday all at the same time. I have loved the Driven series. Crash ended with a gap of things that happened and Aced filled those gaps in. It was an emotional story with lots of tears but Colton and Rylees story has been a roller coaster from the very beginning. Recommended reading. This was a good fill in for the years in between. Loved that she covered a condition like baby blues. Colton and her strong love to pull them through everything that was going on. Just great. Narration was awesome too. I have loved the entire series, but I think this book hit really close to home for me. I found myself in tears a lot in the second half of the novel. I hope this isn't the last we will here from Rylee and Colton! Thanks so much Kristy, I can't wait for your next novel....I have book blues now!! 5.0 out of 5 starsAced - a 5 star read, A to Z!!!!! Oh god, what can I say. Kristy Bromberg you have done it again. A to Z - perfect. The twists, the turns, the ending. All incredible. Thank you for giving a glimpse into the void left from the trilogy, a little window into the 10 years, that wrapped up the whys. Ok book which had so much potential. This is not he missing years at all - this is a dragged out depressing year of pregnancy, blackmail & the baby blues. Once again, "Colton" (read, the writer) needs to learn that swearing is a sign of being lazy with words - he swears like a 17yo boy.....to the point I skipped the majority of his spoiled-brat rants. Loved the originals books - wish I hadn't bothered to read this, but I'm sure the fans of Bromberg will swoon all over it. Wow, so much happening in one book! ... What a crazy & challenging time for Colton & Rylee! What else could be thrown at them? It's wonderful to see how their love shine through it all! I enjoyed this book very much but the first few in the series are still my favourite.